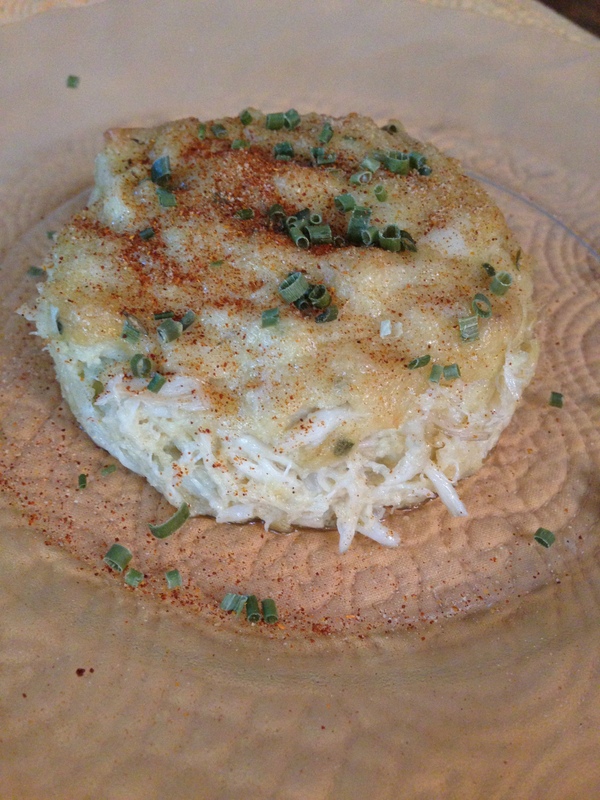 …Gluten free crabcake recipe! Hub and I were so pleased with the way these babies turned out! We are native Marylanders, and Hub said this is the best crab cake he’s ever had, with or without gluten! Pretty high praise, coming from a guy who loves crab cakes, and has had his fair share over the years. I only had a few bites myself (I prefer to pick the crabs and eat the meat right outta the shell), but man, I have to say…..these are definitely winners. The recipe also calls for Gillian’s gluten-free breadcrumbs. I did not have any on hand (I’ve never used it), so I checked out the ingredients. It’s pretty much rice flour. I used plain old white rice flour (Bob’s Red Mill is the brand I use) and it turned out great. We use J.O. Seasoning instead of Old Bay. We used about a tablespoon instead of the teaspoon this recipe calls for. I know, *gasp* coming from a native Marylander right? When I started having lots of food sensitivity issues, we were asking at the seafood markets what they used to steam their seafood, and they all told us they use J.O. It’s not as salty as Old Bay, and it’s much better, in our opinion. But Old Bay is great too, particularly if you like more salt. I’ve recently become allergic to shellfish, so these look extra good to me! And more ocean, always appropriate. Boy, sorry to hear this. I’m not allergic to any foods, but intolerant to many. So I feel your pain! I hope you don’t have a whole list of foods to avoid due to allergies. That would be tough. Just shellfish. But trying to find food for my extended family is an adventure due to dietary restrictions both voluntary and involuntary. Yum! Looks fantastic. When I discovered Old Bay Seasoning from one of my native MD friends, life changed 🙂 haha Fun post! Thanks! I actually meant to put a note – we use J.O. seasoning, not Old Bay. It’s not nearly as salty, and we found out on one of our trips to the eastern shore that’s what all the seafood restaurants use! We love it! The only difference is the saltiness, really. Omg you of all people should try making mayo, Jodi. We bought some small wide mouth mason jars with lids. It tastes so wonderful, it’s a snap to make (10-15 mins tops) and you KNOW what’s in it. Oh and much less expensive!! Ok paleo Kitchenista – that’s a title I’ll accept. It’s challenging to make food people enjoy without gluten and dairy. I think I might share a recipe weekly. I have some really good ones from years of researching and testing. I hope you enjoy this. One other change I forgot to mention: We use J.O. seasoning. It’s less salty than Old Bay, and all the seafood restaurants on the eastern shore use it. We love it. But either one works! Oh and we added a couple tsps more of the JO as well. I need to edit this post. It was so challenging at first that I was (frankly) overwhelmed. Well, not by having to get off gluten, but when I discovered corn…..it was quite depressing. Because it’s so pervasive….it changed my entire life. And not in a good way. I can’t really eat out at all anymore, and I used to love it. I have to take my food everywhere I go, because corn is in everything (and most people don’t even realize it, so you can’t depend on cooks or even chefs to know it’s there…) Yeah, so it pretty much drove me to art, as a way of dealing with all of those limitations. As you say though, when you do make something that tastes amazing, or finding cookbooks like Elana’s, for example……it just brightens everything. She probably saved my life. I’ve depended on her recipes countless times, and they never bomb on me like so many others. I really love her! Wow – never thought of all that – but thankfully you found the art! And sounds like you have a supportive hubby that follows along too. I saw!! Thank you! I hope she keeps 365 open though because I definitely wanna go back to the beginning and see/comment on everything I missed! You’re so right, Debi. Do you have food intolerances too? I often think GMO foods cause a lot of these too (such as GMO corn, which IMO is the reason my body hates corn). You do wind up having to make everything and it can be daunting at times. I follow the Paleo diet strictly due to gluten and corn, mainly. And the dr. told me to stay away from soy, as it’s inflammatory. I don’t tolerate any type of sweetener either. Sounds very similar!! I used to be able to eat everything, too! I think GMOs played a role with what happened to me. Gluten, too. I agree, are bodies weren’t designed to process GMO foods. I’m lucky i really love fresh fruits/berries and seafood. And Crab. Your crab cake really grabbed MY eyes!! Do you spend tons of time in the kitchen, Debi? Or have you found a way to get around that? my way around Fussing in The Kitchen: simply eat fresh unsullied food. no sauces, mixes, gravies. Eating fresh (avo, chicken, seafood, fruits, roasted veg.) no salt/no sugar. just the food itself. * Pain – was an Excellent Motivator. so, i don’t mind my diet so much now. dates, mangos, blueberries, pineapples are so Sweet now, they are my treats. + I can eat the 85% dark chocolate. LOL my husband could not live this way. … I HAVE To. Your seascapes are beautifully done and emotional. Wow, thank you, Victoria! It’s my dream to do beach art, actually. Wow, you made my day with this comment! I’m really drawn to water, waves, the beach, boats…..I’m going to be really focusing on these subjects in the coming weeks and months. I really appreciate your comment! Love me some seafood – and yours sounds like a real special treat. 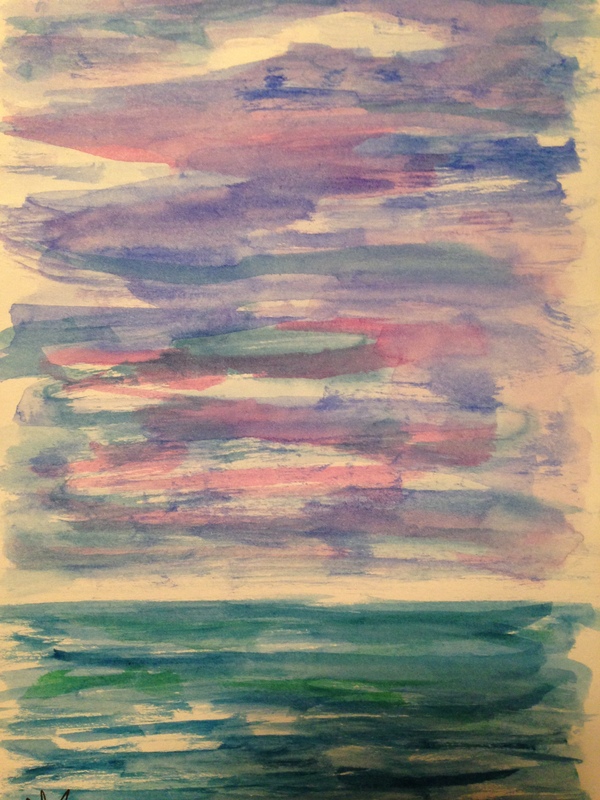 Nice way to kick off summer – seafood and seascapes in your journal. Enjoy! Thanks, C! I’m really going to be working on water and related subjects in the coming weeks and months. These subjects call me the loudest, and always have. Thank you. Looks delicious! Is it sitting on a glass dish or right on a placemat? Hope Vic has a nice Father’s Day! Hi Jean, it’s on a glass dish, lol. He loved them! 😀 He did enjoy his Father’s Day, thanks for asking. This recipe rocks! Crabcake looks tasty. I like the colors in your art. Thanks, Kirk! It was completely amazing. I can highly recommend – and rice flour is so easy to find now at most major chains (such as Safeway, not sure if you have them in MN). Hub actually preferred these to the old glutened ones we used to eat. Thanks for the recipe! AND painting! You’re welcome, Jo! Glad you enjoyed! This recipe looks quite good. I may have to give it a try sometime, especially with your modifications. I’m not really the biggest fan of mayonnaise to begin with but maybe if I made my own it would be okay. It tastes wonderful, the homemade mayo. I can’t recommend either recipe highly enough! I hope you try it. J.O. is really similar to Old Bay seasoning. I bet you can find it on amazon, even if you can’t get it locally, Jill. After converting to the Paleo diet, I’m a strong believer in the carbs vs calories thing. I’ll never have to go on a diet again because of how I have to eat – that’s one good thing. It’s made a believer out of me, as I never really trusted those diets in the past. The idea is to eat the foods cavemen ate, to regain health, etc. I also think GMO food is geared to make us want to eat more of it. I lost weight getting off those too. We even got our cat off of Fancy Feast and he finally got back to a healthy weight also. I was always hungry on that stuff, and so was he lol! Re the flour, yes, the brown rice flour would work equally well. I’m out of that or I’d have used it. It’s only 1-2 T., depending on how much you need of it, so I don’t think it’s gonna make a huge difference which one you choose, in the scheme of it. I do think the brown rice flour is healthier than the white due to blood sugar issues. Oh, that crabby goodness is making my stomach growl! The painting is very atmospheric!